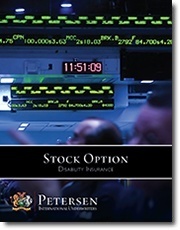 The Stock Option Disability Insurance plan is a long-term, own-occupation, career-ending disability insurance product designed for executives of publicly traded companies. Within publicly traded corporations, many of the top executives are compensated via a number of different sources. The more common sources will include salary, bonus, and stock options. After a review of public compensation data, the results are unanimous, these individuals are paid a modest salary, bonuses tend to vary, and stock options can be as much as 80% of total compensation package. This holds true with the majority of America’s top companies. So what happens to an executive who has a career ending disability? Disability insurance benefits will begin after the elimination period, but their annual stock options will no longer be awarded to them. With executive compensation packages heavily weighted toward stock options, their disability insurance portfolio will have a massive deficit. Benefits are paid on a lump sum basis of up to five times the last three years annual average stock option awards. Petersen International Underwriters is able to secure benefits as much as $50,000,000 or more.